We occasionally receive questions from users regarding UK-based VMS provider Wavestore, known best by many for their analog and hybrid recording solutions. In this update, we will examine their offerings and potential competitive advantages. Like many other VMS providers, Wavestore's VMS is offered in a three-tiered licensing scheme, with versions named Premium, Enterprise, and Corporate. Wavestore also offers DVRss, pre-configured NVRs, and hybrid recorders in varying capacities, as well as capture cards in both analog and HDcctv versions. Wavestore offers a number of add-on modules which add features to the VMS. These modules are offered in two tiers. Tier 1 includes software dewarping of panoramic cameras, interactive mapping, advanced backups, and advanced event managment. Tier 2 consists of integrations to third-party analytics, access control, and command and control systems. Premium: The lowest-tier of Wavestore's VMS, Premium is limited to five concurrent users on a single server. No add-on modules are included. The premium server license has an MSRP of $430 USD, with IP camera licenses costing $110. Analog camera licenses, which include a four-channel Stretch capture card, are $150. Enterprise: Enterprise supports an unlimited number of users on an unlimited number of server. No modules are included. Server licensing has an MSRP of $1,070, IP camera licenses are $160, or $200 for analog channels. Corporate: Corporate supports the same capacities as Enterprise, with the addition of all Tier 1 modules at no additional cost. Server licensing is $2,350, plus $210 per IP channel or $270 per analog channel. Currently, all of Wavestore's operations, both sales and support, are based in London. Users should be aware of this and the potential effect it may have on support, due to time zone differences (five hours ahead of EST). Add a row/column: Two buttons are provided to allow the user to add a new row of cameras to the bottom of the view, or a new column to the right. This allows space to be maximized to best fit cameras to multiple display formats. Or, if users choose to not run the client maximized or in full-screen, it allows them to fit cameras to the window size how they see fit. Free view: Aside from simply adding rows and columns, multi-camera views may also be unlocked completely, allowing users to move and resize specific cameras as they see fit. This allows panoramic cameras or Axis cameras using corridor format to be stretched to fit the image, but also allows less critical cameras to be sized smaller than more important views. Or, users may choose to watch a front door camera in a small window place wherever they choose during investigation of other cameras, for example. Custom views are saved to the server, instead of the client, so users may use their preferred layout no matter which client workstation they use. Wavestore has implemented support for a longer list of panoramic cameras than most VMS platforms in the industry. 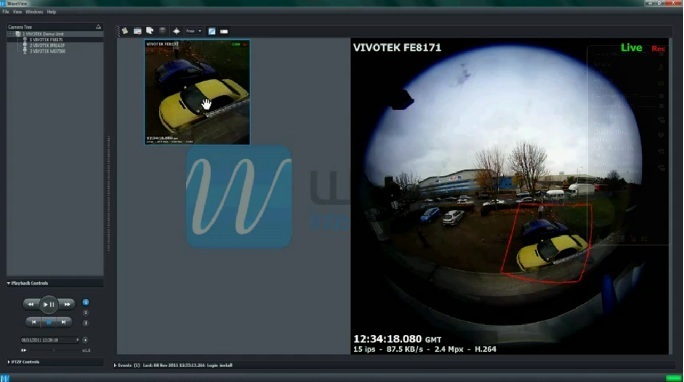 Software currently supports cameras from Mobotix, Grandeye, Vivotek, GeoVision, Lightspace 360, and AMG Panogenics. Some of these manufacturers are relative unknowns outside of the United Kingdom, Wavestore's home market. Dewarping and virtual PTZ are supported on all of these cameras, as well as full panoramic views, selectable for ceiling, desk, or wall mounting. While not important to much of the market, we have received questions fairly regularly about VMS platforms which support Mobotix's proprietary MxPEG protocol. Wavestore has implemented support for this protocol, in addition to MJPEG. Wavestore also supports alarm inputs and outputs on Mobotix cameras, which many platforms do not. Compared to other VMS providers, Wavestore's pricing is for the most part in line among mid- and high-end packages. Compared to low-end offerings, such as Milestone Essential or Exacq Start, Wavestore Premium's $110 per channel pricing is expensive. Wavestore may be more attractive than competitive options to some users due to their integrations to capture cards, panoramic and cameras. Though generally, the majority of the market does not implement either of these features, but for those that do, Wavestore offers more options than competitors. Fans of Mobotix cameras, but not Mobotix Control Center may also find Wavestore attractive.